I love finding activities to enhance the books we read. Each weekday this month, I’ll be sharing picture books that are perfect for preschoolers. I’ll also share a printable and/or hands-on activity for each of the books I’ll feature this month. I can’t wait for you to see what I’ve got! 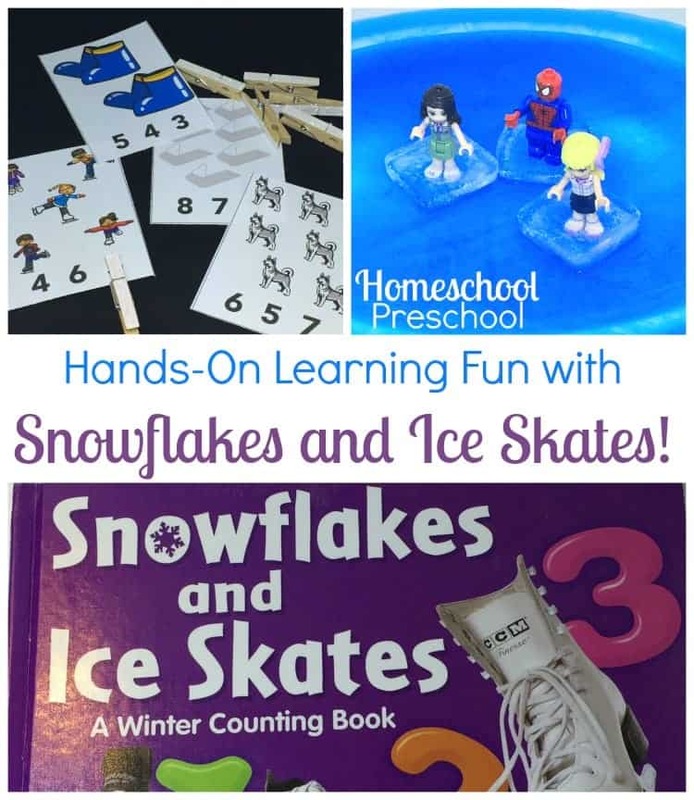 Let’s kick off the month with a winter-themed counting book and super fun hands-on activity! I’m kicking off this series with a fun winter-themed book entitled Snowflakes and Ice Skates: A Winter Counting Book. Snowmen, icicles, sleds, and more! Learn about the coldest season when snowflakes float from the sky and skaters glide across the ice. Have fun counting the things commonly seen during winter. Our big city puts up an outdoor skating rink every year. Your little ones will enjoy creating an ice skating rink for their toys! Fill a cookie sheet or baking pan (I used a serving platter) with water (I tinted mine blue) and freeze it. At the same time, fill an ice cube tray with water. Let your little ones submerge their favorite toys in the ice cube trays. LEGO friends and Polly Pockets are the perfect size for this. My daughter told me after the fact that My Little Pony minis would have worked well, too. Once the cubes and the cookie sheet are frozen solid, it’s time to play! 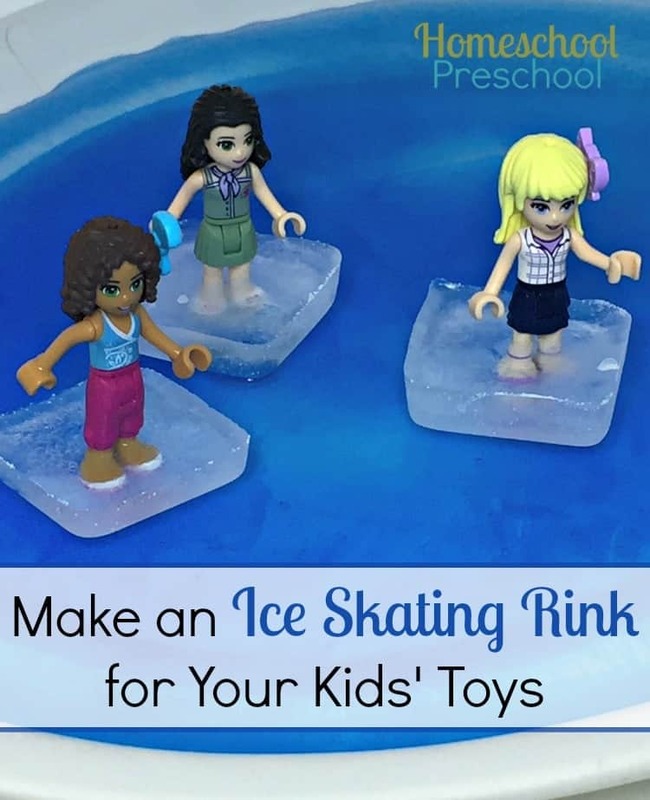 Your little ones will love letting their figures ‘skate’ across the ice until it melts. Once it’s melted, refreeze it and start all over again. Print out the count and clip cards below. Laminate them for durability if you choose. Have your little ones count the images on each card and mark the correct number with a sticker, clothespin, paper clip, or dot marker. 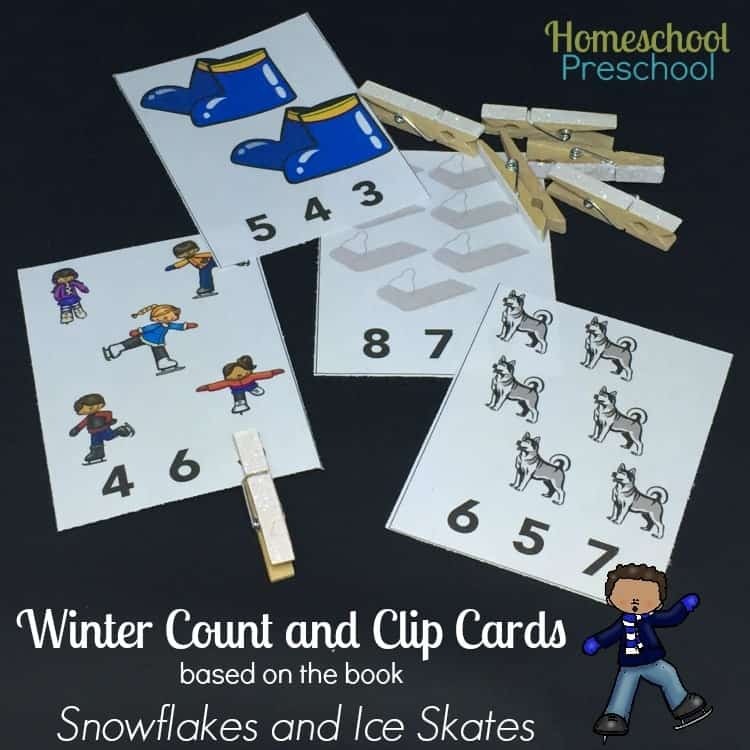 Click here to download your free count and clip cards.